Contemporary paintings exhibit in Canada and abroad. Abstract paintings,action paintings, zen-focused and tribal images paintings influence by Lez's extend world travelling. Artifacts from Papua New Guinea and Oceania. or group classes available on request. Lez moved studio "Allworks" from Halfmoon Bay to the south part of Powell River, park like property ten minute drive from Saltery Bay. Niepo is inviting the art and artifacts collectors to visit him at his new studio. Call for appointment. He can be reached by telephone at 604.487.0825. Fifteen kilometres south of town, at a bend of a slow running creek that forms a pool perfect for trout, painter and musician Lez Niepo has devoted the past four years to his dream project. Niepo, and his wife Eva moved to Powell River from Halfmoon Bay on the Lower Sunshine Coast to build a studio that would be big enough to allow Niepo to pursue all his passions. "We decided to sell the property and house in Halfmoon Bay because the studio wasn't big enough," he said. "We thought about Powell River and just stumbled on this house." Niepo said that when he saw the house it felt right immediately and had great potential. The only problem was that the house was not currently on the market, so he went up to the front door and asked the owner if he would be interested in selling. After two years of negotiating the deal, Niepo bought the property and started work on developing his creative space. The area which would become his studio, at that time, was nothing more than a covered pad of concrete. Now it is a completed studio which stands separate next to his home. It is not simply his work area. He has created a space that is part gallery, part studio all in an effort to aid his creative spontaneity. The air inside smells faintly of old acrylic paint and wood smoke, and its lights, warm and yellow, illuminate Niepo's paintings which hang on the high walls. Framed colourful canvases, which at first glance appear to be abstracts but after closer attention reveal hints of the jungle, fill the room. Several rest, leaning against the wall in the corner-work to sort through. Wooden carvings from the jungles of Papau New Guinea stand, like miniature totem poles but with black feathers and hair, to greet visitors as they enter. Tribal masks hang fixed to the walls. A jet-black electric guitar sits idle in its stand connected with a snake of patch cord to effects pedals, a small mixing board and an amp. At the centre of the room is Niepo's supply table with crumpled paint tubes and plastic containers stacked to the side. His brushes, some thick like those used by Chinese calligraphy masters, hang suspended from the light box over the table. At the back of the studio, behind wooden sliding Japanese paper panel doors, is Niepo's tai chi studio. The music of fusion jazz greats Chick Corea and Miles Davis play low in the background as Niepo relates his story. "I love to have my environment, my music and my isolation here," he said, "so I can do my tai chi, blast the music and grab a brush. Some people can work in their kitchen, but I like spontaneity. Whatever I do, it's not planned. Most of my work is subconscious work. I start with an abstract form and then something is triggered and I start to flesh out images. I never know what is going to happen." Niepo's last solo gallery show was held in 2008 at Sunshine Coast Arts Centre in Sechelt, though he has also shown his art in San Francisco, Hawaii and in Europe. 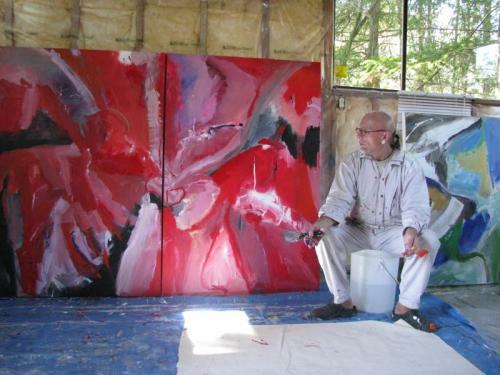 He sells much of his work to private collectors in Europe. "Everything was put on the back burner [when we moved]," he said. "No studio, no new work. I [couldn't] approach the galleries." The artist first moved to Canada in 1973 from Finland. He had grown up in Poland and left to pursue his music and painting. He settled in Toronto, but found there was not much opportunity for abstract painter blues guitarists so he packed his bags and he and Eva moved out west. They intended to find an apartment in Vancouver, but found themselves on the Lower Sunshine Coast. After spending some time in Gibsons, they found a house in Halfmoon Bay and he established his studio, Allworks. They lived there for 35 years. I called it "Allworks " because I paint, play music and teach tai chi, he said. He has been teaching tai chi for six years, though he has been interested in the ancient martial art since he was young. "It's like a meditative dance for moving energy and when you know the form you don't even have to think about the next movement," he said. His work is a clear example of art imitating life-in this case, his own. His early work was influenced by the European abstract movement and American Jackson Pollock. In the 1980s and 1990s he explored the South Pacific islands of Fiji, Vanuatu, the Solomons and Papau New Guinea. The more time he spent in the jungle the more abstract images of the jungle and tribal mysticism started seeping into his paintings. Since then he has spent time exploring Burma and Thailand and his paintings have started to develop "a more abstract zen quality," he said. "I've been slaving to create this place and the gardens for almost the last four years," he said. "Finally it's finished." Niepo is inviting the public to visit him at this studio by appointment. He can be reached by telephone at 604.487.0825. Website services is provided by Sun Coast Designs. Copyright © 1997 - 2013 All rights reserved.